The Church of Jesus Christ of Latter-day Saints is governed by the priesthood. The priesthood, which is always associated with God’s work, “continueth in the church of God in all generations, and is without beginning of days or end of years” (D&C 84:17). It is upon the earth today. Men young and old are baptized into the Church, and when they are judged worthy they are ordained to the priesthood. They are given the authority to act for the Lord and do His work on the earth. How did the Melchizedek and Aaronic Priesthoods get their names? The priesthood is divided into two parts: the Melchizedek Priesthood and the Aaronic Priesthood (see D&C 107:1). “The first is called the Melchizedek Priesthood … because Melchizedek was such a great high priest. “Before his day it was called the Holy Priesthood, after the Order of the Son of God. “But out of respect or reverence to the name of the Supreme Being, to avoid the too frequent repetition of his name, they, the church, in ancient days, called that priesthood after Melchizedek, or the Melchizedek Priesthood” (D&C 107:2–4; italics in original). Those holding the Melchizedek Priesthood have the power and authority to lead the Church and direct the preaching of the gospel in all parts of the world. They administer all the spiritual work of the Church (see D&C 84:19–22; 107:8). They direct the work done in the temples; they preside over wards, branches, stakes, and missions. The Lord’s chosen prophet, the President of the Church, is the presiding high priest over the Melchizedek Priesthood (see D&C 107:65–67). What is the difference between the priesthood and the keys of the priesthood? Which priesthood leaders receive keys? “The Priesthood in general is the authority given to man to act for God. Every man ordained to any degree of the Priesthood has this authority delegated to him. “But it is necessary that every act performed under this authority shall be done at the proper time and place, in the proper way, and after the proper order. The power of directing these labors constitutes the keys of the Priesthood. In their fulness, the keys are held by only one person at a time, the prophet and president of the Church. He may delegate any portion of this power to another, in which case that person holds the keys of that particular labor. Thus, the president of a temple, the president of a stake, the bishop of a ward, the president of a mission, the president of a quorum, each holds the keys of the labors performed in that particular body or locality. His Priesthood is not increased by this special appointment; … the president of an elders’ quorum, for example, has no more Priesthood than any member of that quorum. But he holds the power of directing the official labors performed in the … quorum, or in other words, the keys of that division of that work” (Teachings of Presidents of the Church: Joseph F. Smith , 141; italics in original). How do priesthood keys safeguard the Church? 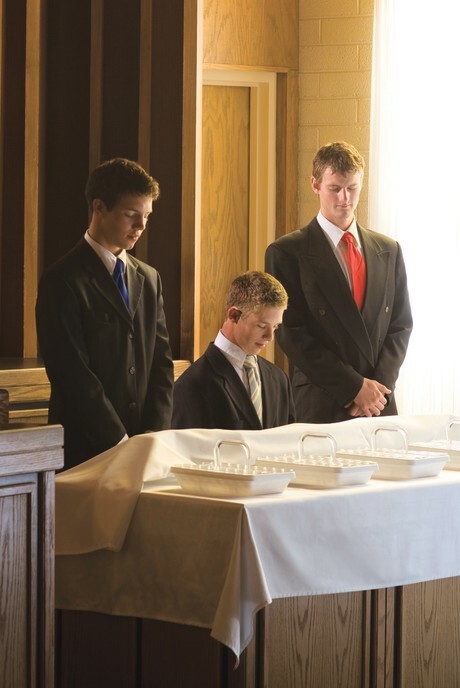 In what ways do Aaronic Priesthood holders serve? When the Aaronic Priesthood is conferred on a man or boy, he is ordained to an office in that priesthood. The offices in the Aaronic Priesthood are deacon, teacher, priest, and bishop. Each office carries duties and responsibilities. Each quorum is presided over by a quorum president, who teaches the members their duties and asks them to fill assignments. Some men join the Church or become active after they have passed the usual age to receive the offices of this priesthood. They are usually ordained to an office in the Aaronic Priesthood and can soon be ordained to other offices as they remain worthy. A young man who has been baptized and confirmed a member of the Church and is worthy may be ordained to the office of deacon when he is 12 years old. The deacons are usually assigned to pass the sacrament to members of the Church, keep Church buildings and grounds in good order, act as messengers for priesthood leaders, and fulfill special assignments such as collecting fast offerings. A worthy young man may be ordained a teacher when he is 14 years old or older. Teachers have all the duties, rights, and powers of the office of deacon plus additional ones. Teachers in the Aaronic Priesthood are to help Church members live the commandments (see D&C 20:53–59). To help fulfill this responsibility, they are usually assigned to serve as home teachers. They visit the homes of Church members and encourage them to live the principles of the gospel. They have been commanded to teach the truths of the gospel from the scriptures (see D&C 42:12). Teachers also prepare the bread and water for the sacrament service. A worthy young man may be ordained a priest when he is 16 years old or older. Priests have all the duties, rights, and powers of the offices of deacon and teacher plus some additional ones (see D&C 20:46–51). A priest may baptize. He may also administer the sacrament. He may ordain other priests, teachers, and deacons. A priest may take charge of meetings when there is no Melchizedek Priesthood holder present. He is to preach the gospel to those around him. A bishop is ordained and set apart to preside over the Aaronic Priesthood in a ward. He is the president of the priests quorum (see D&C 107:87–88). When he is acting in his Aaronic Priesthood office, a bishop deals primarily with temporal matters, such as administering finances and records and directing care for the poor and needy (see D&C 107:68). A bishop is also ordained a high priest so he can preside over all members in the ward (see D&C 107:71–73; 68:15). A bishop is a judge in Israel (see D&C 107:74) and interviews members for temple recommends, priesthood ordinations, and other needs. It is his right to have the gift of discernment. How have you been blessed through the service of Aaronic Priesthood holders? In what ways do Melchizedek Priesthood holders serve? The offices of the Melchizedek Priesthood are elder, high priest, patriarch, Seventy, and Apostle. Elders are called to teach, expound, exhort, baptize, and watch over the Church (see D&C 20:42). All Melchizedek Priesthood holders are elders. They have the authority to bestow the gift of the Holy Ghost by the laying on of hands (see D&C 20:43). Elders should conduct meetings of the Church as they are led by the Holy Ghost (see D&C 20:45; 46:2). Elders may administer to the sick (see D&C 42:44) and bless little children (see D&C 20:70). Elders may preside over Church meetings when there is no high priest present (D&C 107:11). A high priest is given the authority to officiate in the Church and administer spiritual things (see D&C 107:10, 12). He may also officiate in all lesser offices (see D&C 68:19). Stake presidents, mission presidents, high councilors, bishops, and other leaders of the Church are ordained high priests. Seventies are special witnesses of Jesus Christ to the world and assist in building up and regulating the Church under the direction of the First Presidency and Quorum of the Twelve Apostles (see D&C 107:25, 34, 38, 93–97). An Apostle is a special witness of the name of Jesus Christ in all the world (see D&C 107:23). The Apostles administer the affairs of the Church throughout the world. Those who are ordained to the office of Apostle in the Melchizedek Priesthood are usually set apart as members of the Quorum of the Twelve Apostles. Each one is given all the keys of the kingdom of God on earth, but only the senior Apostle, who is President of the Church, actively exercises all of the keys. The others act under his direction. How have you been blessed through the service of Melchizedek Priesthood holders? The Lord has instructed that the holders of the priesthood be organized into quorums. A quorum is a body of brethren holding the same priesthood office. The deacons quorum, which consists of up to 12 deacons (see D&C 107:85). The presidency of the deacons quorum is called by the bishop from among the quorum members. The teachers quorum, which consists of up to 24 teachers (see D&C 107:86). The presidency of the teachers quorum is called by the bishop from among the quorum members. The priests quorum, which consists of up to 48 priests (see D&C 107:87–88). It is presided over by the bishop of the ward to which the quorum belongs. The bishop is a high priest and thus also belongs to the high priests quorum. Whenever the number specified for a quorum is exceeded, the quorum may be divided. At the general Church level, the members of the First Presidency form a quorum, as do the Twelve Apostles. The Seventies are also organized in quorums. Each elders quorum “is instituted for standing ministers; nevertheless they may travel, yet they are ordained to be standing ministers” (D&C 124:137). They do most of their work near their homes. The quorum is to consist of up to 96 elders, presided over by a quorum presidency. When this number is exceeded, the quorum may be divided. Each quorum includes all high priests residing within the boundaries of a stake, including patriarchs and bishops. The stake president and his counselors are the presidency of this quorum. The high priests in each ward are organized into a group with a group leader. How can priesthood quorums help strengthen individuals and families? When ordained to the priesthood, a man or boy automatically becomes a member of a priesthood quorum. From then on through life, it is expected that he will hold membership in a quorum of the priesthood according to his office (see Boyd K. Packer, “What Every Elder Should Know—and Every Sister as Well: A Primer on Principles of Priesthood Government,” Ensign, Feb. 1993, 9). If a priesthood quorum functions properly, the members of the quorum are encouraged, blessed, fellowshipped, and taught the gospel by their leaders. Even though a man may be released from Church callings, such as teacher, quorum president, bishop, high councilor, or stake president, his membership in his quorum does not change. Membership in a quorum of the priesthood should be regarded as a sacred privilege. How can auxiliaries to the priesthood help strengthen individuals and families? All organizations in the Church work under the direction of priesthood leaders and help them carry out the work of the Lord. For example, the presidencies in a ward’s Relief Society, Young Women, Young Men, Primary, and Sunday School organizations serve under the direction of the bishopric. These organizations are called auxiliaries to the priesthood. What role do you have as an individual in helping priesthood quorums and auxiliaries be successful? “If you do not understand someone’s comment, ask a question. You might say, ‘I’m not sure I understand. Could you explain that again?’ or ‘Could you give me an example of what you mean?’” (Teaching, No Greater Call , 64).